Chinese President Xi Jinpeng's visit to India appears to have happened at a time and in an environment that was surely not tailored in the same fashion as Beijing had got used to dictating since past many decades. It all started with the inauguration of Mr. Narendra Modi when the new establishment in New Delhi invited all heads of states from the neighbourhood except China -- for whatever logic. Subsequently Mr. was made to wait till the Rath Yatra of Modi diplomacy completed its pilgrimage to nearly each of such centres of Asia that have been perpetually threatened by the same bully neighbour that Indian has been dealing with since the geo-political map of Asia changed with the advent of a Communist ruled China in 1949. The very first visit of Mr. Modi to Bhutan was far more than reassuring to this tiny Himalayan nation that has been feeling uncomfortable pressure from China on a host of delicate issues. It was soon followed by his visit to Nepal that had already started suffering from the trauma of a honeymoon gone utterly wrong with her northern neighbour who, she thought, would countercheck India in Kathmandu's triangular love affair. The most strategic halt of Mr. Modi's diplomatic bandwagon was at Japan whose relations with China, thanks to Beijing's belligerent and bullying postures, have already entered the dangerous zone of late. Multiplied by the old personal rapport between Mr. Modi and his host Japanese Prime Minister Shinzo Abe, the duo was able to take India-Japan relations to a new orbit of mutual interest and cooperation. In this visit Modi-Abe duo gave a clear and unambiguous signal to their common bête-noir on who stands where in the most delicate triangle of today's Asia. If this was not enough for China, Mr. Modi's government sent Indian President Pranab Mukherjee to China and Vietnam as the messenger of good will and peace from India. That section of diplomatic observers who love to interpret developments in more exciting manner than others, is underlining the fact that Indian President visited Vietnam via China only to ensure that he was not missed by the Chinese diplomatic radars on his visit to Vietnam. They specifically underline the timing of this visit. It may be just a coincidence that only a day after the Indian President concluded his China visit and signed an Indo-Vietnam accord on supporting Vietnam in her section of South China Sea, and a couple of days before the Chinese President Xi Jinpeng started his India visit, the Chinese troops barged into Indian border area at Chumar in Ladakh. What followed was something that was never seen or expected on such moments earlier during Congress dominated rule in New Delhi when bowing down to Chinese threats and hiding such events from the public view had come to stay as an accepted norm. Unlike ever in the past, instead of downplaying the Chinese incursion, the Indian Prime Minister strongly objected to this act of Chinese army and demanded his guest Mr. Xi to withdraw this aggression. Mr. Modi's argument that Chinese army could not have taken such a step without approval of its high command, Mr. Xi, who also happens to be the head of China's defence forces, had to eat the humble pie. Chinese army contingent vacated this aggression and moved back to its previous position by 9.45pm on the first night of its Commander-in-Chief's stay in India. No surprise that this event took away a lot of sheen off Mr. Xi's much awaited India visit. It also exposed the Chinese government's confused mind in dealing with the new Indian government under Mr. Modi. But it would be too naive to evaluate Mr. Xi's India visit only through this unfortunate event. The Chinese President's India visit would be remembered for many firsts in the direction of improving relations between the two governments and taking good will between the two peoples to a better level in coming years. For example, 16 agreements and MOUs between two sided during Mr. Xi's visit are expected to narrow the trade gap which has been so far keeping on disadvantage. One can hope that $20 bn committed as Chinese investment in India and opening of Chinese market to Indian companies will also contribute towards loosening political tensions on both sides. Chinese initiative in improving cooperation with India in the nuclear field and offering bullet train projects to India are bound to not only take the relations to a higher pedestal, but will also help India in negotiating deals with other countries in similar fields. Although no visible agreement on solving the border issue between the two countries has emerged from this visit, but events related to Ladakh will surely help Mr. Xi and his colleagues to realize that with new changes in India, the border tension and indecisiveness with India is no longer going to pay towards taking the relations ahead. Mr. Modi's resolve on this issue is bound to help the Chinese leadership in amending their attitude not too far in future. Another interesting change in Chinese approach that has come to fore during Mr. Xi's visit is his offer to make India a member of Shanghai Group. But the way he has demanded membership of SAARC in return of this 'favour', it may not go down well with the Modi Government because New Delhi is quite wary of China overwhelming the SAARC to end India's supremacy in this forum. In the same public speech before a select audience Mr. Xi's attempt to put down India as a 'small' and a 'regional' power did not contribute much in improving feelings on the Indian side either. One expected that Mr. Xi's visit may put an end to India's concerns over Chinese practice of issuing stapled visas to Indian citizens from Jammu & Kashmir and Arunachal. But not much distance appears to have been covered. Looking at China's claims over Arunachal Pradesh as 'Southern Tibet' the issue appears to go from bad to worse in future more because of internal pressures in China than from India. Chinese think tanks and government controlled media has raised so much hype over past few years on Arunachal that it will be difficult for Mr. Xi's government to climb down. China's offer to open Nathu La road for Indian Hindu pilgrims to visit Kailash Mansarovar will be seen as a welcome step in India. But this issue has its disadvantages also like a double edged knife. It has been seen that most pilgrims on return from the Yatra develop a feeling of hurt by seeing their holy place under Chinese control. Still, despite its limitations, Mr. Xi's India visit has surely taken India-China relations to a better place than ever in past many decades. At the same time it has added significantly to the international stature of Modi government in New Delhi in its dealings with other major countries. 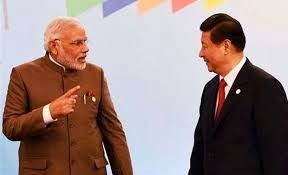 Mr. Modi's style of dealing with India's neighbours, China's foes and now with China surely marks a qualitative and generic shift of Indian polity from a six decade old Nehruvian suicidal idealism to a pragmatic and self respecting style for which Sardar Patel has been always remembered and respected. NOTE-- Vijay Kranti is a senior Indian journalist, photographer, and Tibetologist, based in New Delhi.